There are many different ways to approach crochet. You can approach it with a fashion mindset or with a craft perspective, for example. No matter which way you choose to approach it, your crochet work will benefit from adding an artistic slant to it now and then. One fabulous way to free up the artist inside and get those creative juices flowing is to explore freeform crochet. Freeform crochet means not only that you don’t follow a pattern but also that you don’t necessarily follow the standard “rules” of crochet. You add stitches anywhere you see fit. You start blocks of fabric and then end them and start anew. It is a form of painting with yarn and a hook instead of canvas and a brush. Do you like the idea of trying freeform crochet but have some hesitations? This is a common situation but it doesn’t have to be the place where you remain stuck. The following five tips can help you get over that hump and on your way to creative crocheting. 1. Accept that what you feel is fear. If someone asks you why you haven’t tried freeform crochet, yet, you may give a variety of answers. You may say that you are lazy and have a tendency to procrastinate. You may say that you don’t have the time or the yarn or the money. You may say that you don’t know why. But the answer for almost everyone is “because I am afraid”. Exploring our own creativity is a very scary thing. It requires making decisions instead of just following blindly along a pattern. It requires risking that what we make will be ugly or boring or get laughed at. It is totally okay to feel that fear. Just acknowledge that this is the reason that you haven’t tried freeform crochet yet, give yourself a chocolate bar and some reassuring words and get ready to forge ahead. When you feel trepidation or frustration, remember that it’s just fear. Get more chocolate or buy yourself a really nice skein of yarn and keep on going! 2. Let go of the product; focus on the process. Making freeform crochet is not about making a specific item. It is about making art. Accepting this means embracing more of that fear, letting go of control, leaping into the empty space between you and your crochet hook. A product will come out of the process. You may or may not like it, use it, keep it or sell it. But what will surely happen is that the whole process will teach you something new about crochet and perhaps about yourself. It is the process that matters more than the product in freeform crochet. 3. Look around for lessons in freeform crochet. Although you don’t follow patterns in freeform crochet, you can benefit from instructions, tips and guidance. Don’t hesitate to look for these. One great place to start is the Freeform Crochet section of the Crochet Master Class book edited by Jean Leinhauser and Rita Weiss. In this chapter “Master” Prudence Mapstone shares her experience to help you get comfortable with freeform. Another great resource is the July 2011 archives of the Crochet Liberation Front blog, which contain day-by-day freeform CAL instructions that you can follow or reference for ideas about your first freeform crochet project. 4. 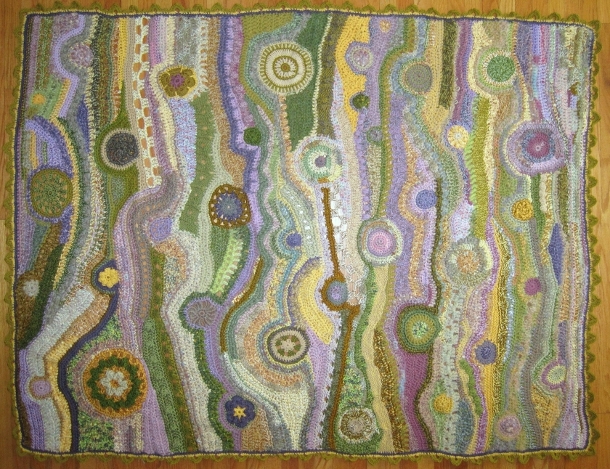 Check out inspiring freeform crochet art. You don’t have to view instructions to get ideas for your own freeform crochet work. You can also just see what other people are doing. Check out the work of Crochet Queen Gwen Blakley Kinsler, artist Emily Barletta or wearable art maker Myra Wood. 5. Take notes and photos of your journey. One ideal way to get the most out of your freeform experience is to track it. I do this by keeping a crochet journal. I jot down notes to myself about what I learned, what I liked, what didn’t work, what I want to explore further. I occasionally add photos or sketches. Sometimes this leads to journal entries about my feelings regarding the freeform process, crochet or something else entirely that may end up on my mind. This writing informs me about what I’m learning, reaffirms the value of freeform crochet and gives me something to look back on when I actually have a freeform piece that I want to do more with. Do this in whatever way suits you – upload Flickr photos, add post-it notes to your pieces, buy a beautiful journal and write poetry about your freeform work … this is another part of the creative process and should be something you enjoy! There are a lot of reasons that you may choose not to try freeform crochet. But are they good reasons? Take the chance and see if it’s something that enhances crochet for you! 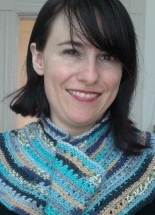 Kathryn Vercillo is a freelance writer and crochet artist who runs the blog Crochet Concupiscence. She is currently working on a book about the health benefits of crochet and designing a line of repurposed crochet dresses. Article © Kathryn Vercillo. All rights reserved. There is an International Freeform Crochet Guild. We have been around over 10 years, Prudence Mapstone & Margaret Hubert are members, as well as over 1000 others. We have a Yahoo group, do an annual Freeform Challenge (have just chosen our theme for 2012) which is published as a book as well as an online show. Thanks for the shout-out, Kathryn! I appreciate it. Congrats on the book you are working on. I love the topic: crochet & health. Let me know when it comes out! Some great advice! And thanks for featuring my afghan! Dear Kathryn, what an inspirational person you are! I lead a crochet group in a mental health day service – I recently purchased your book – Wow, it has reinforced what I already knew about doing crochet, thank you so much from an avid crochet fan who is trying to spread the ‘word’. I am 57 and have been crocheting since the age of six. Over the past three or four years I haven’t paid much attention to the crochet world and was absolutely in LOVE when I recently stumbleled across images of freeform crochet online. I have been thinking of ways I could use my crochet work to generate extra income and. I am determined that whatever I do will be likely to make my work easy to distinguish from others in my local area. I believe freeform crochet is the answer! Thank you for the inspiration. Yes, I am afraid that when I’m ready to start I won’t be able to do anything g but crochet back and forth, but I’ll try. Free form is so beautiful. I’m tired of the same old. I would like some free patterns to get started — to get my creative juices (that I think are frozen) get going.